Find Used Cars In Your Area! The National Automobile Dealer's Association or NADA offers NADA car values online. When you visit their website, the car values you get will depend upon whether you're a dealer or an individual. What Can I Get From the NADA Website? When you first visit the NADA homepage, you will be asked if you are business (dealer) or a consumer (individual). If you click on the business tab, you will be required to input your user name and password. This section is for dealers only and every dealership pays a cost to access this portion of the site to get NADA car values. New and Used Prices and Specs - Here you can get car values for both new and used vehicles and all the manufacturer specifications. Photos and 360 Views - A picture is worth a thousand words they say, and browsing photos of your favorite vehicle along with 360 degree views is a nice feature of the NADA consumer section. Expert Reviews and Videos - Experts from NADA, and Cars.Com test-drive various makes and models and offer their opinions. These are great tools to use as research before you buy. They also consider which used cars have the best resale value. Compare New and Used Side By Side - This function allows you to compare up to four new or four used vehicles all on one screen. Tips and Advice For Buying and Selling - If you're looking for buying tips or want to sell your car, this section offers great articles and ideas to help you. Incentives and Rebates - Here you'll find all the current manufacturer rebates and incentives such as low interest and financing rates. Cost to Own Information - You can get both dealer invoice price and the manufacturer's suggested retail price or MSRP as well as a five-year true cost to own. This section also offers approximate yearly depreciation, fees, and taxes based on your zip code. It is important to note here that NADA does not disclose dealer advertising fees or destination charges; both of which will not be in the dealer invoice price offered. Classifieds - Buy and Sell - If you want to buy or sell a car, the NADA website offers selling tips, used car classifieds and buying checklists, and a place where you can upload your own ad. 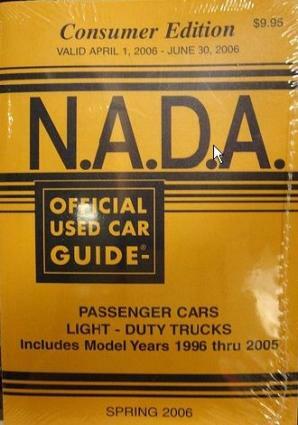 The NADA car values are updated every month in book and online form. Dealer NADA car values are different than the consumer car values they offer. Rough Trade-In - This value considers interior and exterior damage, high mileage, and mechanical problems. Average Trade-In - This value is an average value for your vehicle, or what is close to what a dealer might offer you for your trade. Clean Trade-In - If your Ford Escape is in excellent condition, this value is close to what a dealer would offer you if you traded the vehicle in. Clean Retail - This is the retail value of the vehicle if you sold it on your own. You may wonder, if you are offered rough, average, and clean trade-in values from NADA, why are they only close to what a dealer might offer you for the trade? The answer to this is because the consumer NADA values don't consider dealer-reconditioning costs. Dealer reconditioning costs are a true expense that dealers have when they accept a trade-in vehicle. These costs consists of a full detail, body and paint repairs, or other repairs needed, and the money it will cost to have an employee repair or detail the vehicle or use an outside source to get it ready for sale. NADA car values for consumers are a great way to find out what your car is worth, what a new car will cost you, along with great car buying tips. Remember, even if you aren't a dealer, the NADA is a great consumer resource.